1. Are there any dress regulations for the Pattaya golf clubs ? Men : Golf shoes, socks, tailored pants / Bermudas, collared polo or sports / golfing t-shirt. Ladies : Golf shoes, socks, tailored Bermudas / pants / skirt, blouse / collared polo or sports / golfing t-shirt. Yes! Caddies are required at every course. They will carry your golf clubs, assist you with club selection, repair divots, rake bunkers explain the lie of the land and help finding any lost balls. 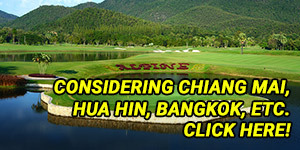 The caddy fee varies from course to course but is generally around 300 baht / caddy /18 . The caddy fee does not include a caddy tip. An appropriate caddy tip is generally displayed in each clubhouse or pro shop. No! Every Pattaya golf club has excellent food and drink facilities in the club house and around the golf course. Pattaya can get quite hot and humid at times. Be sure to drink plenty of water before, during and after your game to minimize dehydration. 4. Are there changing rooms with showers at Pattayas golf courses ? 5. Most of Pattayas golf clubs have carts ? Note that individual carts are mandatory at Laem Chabang, Burapha, Siam Country Club and St. Andrews golf courses. Can I rent or purchase shoes and golf clubs at the golf club ? 6. Can my family and friends accompany me on the golf course ? 7. Do I need a handicap card to play ? 8. Can I share my golf clubs with another player ? 9. Will the golf club assist in finding another golfer for me to join? Yes! Just ask the ‘Starter’ before you tee off if you can play with another golfer, or when you make your golf booking ask the tour agent to assist. They will make the request to the ‘Starter’ for you. 10. Can a five-ball play together ? 11. Can I get a refund if its raining ? If the golf club is closed due to rain they will give you a raincheck and allow you to play another day. If the golf course is open, you have started playing but have played less than 9 holes they will give you a rain check for 9 holes, (you will still have to pay for your caddy and equipment rental). If you have played more than 9 holes, no rain check will be issued. 12. 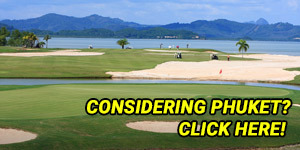 Can I get a discount from the golf club if I show my authorized PGA membership card ? 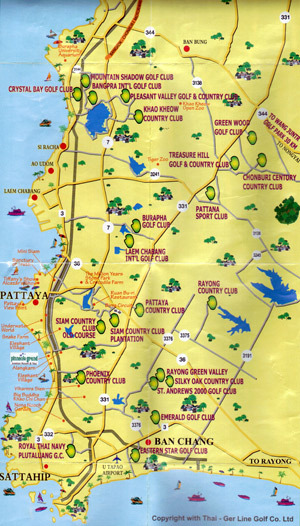 Each of Pattayas golf clubs have different regulations regarding international PGA membership. Advise us when you make your booking and we will check with the specific golf course. Don’t forget to bring your PGA membership card. • Payment terms and conditions. Prepayment for golf only or golf packages including hotel bookings is required. Payment may be made securely online with Visa or MasterCard credit cards or by bank transfer. A deposit of 30 % is required as soon as your booking has been confirmed. The balance of 70% is required a minimum of 14 days prior to arrival. For cancellations made more than 7 days before your tee-off reservation we will refund any payment less 25% charges. For cancellations made more than 14 days before your tee-off reservation we will refund any payment less 10% charges. For cancellations less than 7 days before your tee-off reservation or no show, no refund will be made. For cancellations made more than 14 days before your tee-off reservation we will refund any payment made. For cancellations less than 3 days before your tee-off reservation or no show, no refund will be made. Details of the individual hotel polices regarding cancellation charges will be sent once all reservations have been confirmed as cancellation policies vary depending on the hotel. All refunds will be paid via Bank Transfer. Credit card & administration fees will be deducted from the total refundable amount. We recommend that all our customers have a fully comprehensive travel insurance policy before commencing their holiday. • We will send you our bank details and wiring instructions by email upon booking confirmation. • on our secure server in real time (128-bit encrypted secure socket layer (SSL) technology - no storage or manual handling of credit card details). We will issue a direct link and instructions for using our online payment system.